Monosaccharides are the simplest form of carbohydrates and may be subcategorized as aldoses or ketoses. The sugar is an aldose if it contains an aldehyde functional group. A ketose signifies that the sugar contains a ketone functional group. Monosaccharides may be further classified based on the number of carbon atoms in the backbone, which can be designated with the prefixes tri-(3), tetr-(4), pent-(5), hex-(6), hept-(7), etc. in the name of the sugar. Monosaccharides are often represented by a Fischer Projection, a shorthand notation particularly useful for showing stereochemistry in straight chained organic compounds. The L and D confirmations represent the absolute configuration of the asymmetric carbon farthest away from the ketone or aldehyde group on the monosaccharide. On the Fischer projection, if the farthest hydroxyl(-OH) group is on the right, then it is classified as D sugar, if the hydroxyl group is on the left, then it is a L sugar. Example of Diastereomers. The areas marked blue indicate the differing stereogenic centers. Due to the fact that carbohydrates contain multiple stereocenters, many isomers are possible including enantiomers, diastereoisomers, and epimers. Two carbohydrates are said to be enantiomers if they are nonsuperimposable mirror images of one another. An example of an enantiomer is the D and L isomers of glucose, as shown by the figure to the right. A second type of isomer seen in carbohydrates are diastereoisomers. Carbohydrates are classified as diastereomers if their chiral carbons are connected to the exactly the same substrates but connected at differing configurations (R or S). Unlike an enantiomer, diastereomers are NOT object and mirror image. An example of two carbohydrates that are diastereoisomers are D-Glucose and D-Altrose as seen in the figure to the left. Lastly, another type of isomer that carhbohydrates that can take on are epimers. Epimers are two diastereomers that differ only at one stereocenter. As shown in the figure below, D-Glucose and D-Mannose are an example of an epimer. An Aldose' contains an aldehyde with two or more hydroxyl groups attached; one of the hydroxyl groups is at end opposite to the aldehyde. An Aldose is a type of monosaccharide, which is a chiral molecule that plays a key role in the development of nucleic acids. The two simplest forms of Aldoses are L- and D-Glyceraldehydes, which are three-carbon structures that each contain one aldehyde and two hydroxyl groups. The L and D symbols apply to the two different configurations of the asymmetric carbon farthest from the aldehyde group. Aldoses can have three or more carbons. Aldoses are distinguishable by the carbonyl(C=O) group located at the end of the carbon chain, which differs from ketose, which has the carbonyl group in the middle of the carbon chain. Furthermore, for example, the simplest sugar with three carbons - glyceraldehyde (containing an aldehyde group), and sugar with seven carbons - L-glycero-D-manno-heptose, can be found in this category. Each sugar has n = C - 2 numbers chiral center(s), where C is the number of carbons. We can also use the formula 2n to calculate the maximum number of stereoisomers that are possible to exist in a molecule. Again, n is the number of stereocenter(s). For example, aldotriose has three carbons(C), one stereocenter(n) - it has two stereoisomers. Following the same calculation, we know that aldotetroses have four stereoisomers, aldopentoses have eight stereoisomers, and aldohexoses have sixteen stereoisomers. We usually focus on the D sugars since they are more frequently in natural existence, while the L sugars, diastereomer of the D sugars, are less common. See Chirality for the naming using D/L system. Trioses are monosachrides with three carbon atoms; aldotrioses have an aldehyde functional group at carbon number one. A common aldotrisose is glyceraldehyde. They have a single asymmetric carbon atom: D- and L-glyceraldehyde are enantiomers of one another. Glyceraldehydes are one of the smallest monosaccharides. Tetroses are monosaccharides with four carbon atoms. An aldotetrose has an aldehyde functional group at carbon number one. The two common types of aldotetroses are D-Erythose and D-Threose. The D configuration is more favor. Since D-Erythose and D-Threose are not mirror image of one another, they are diasteroisomers of one another. They have a different configuration at the second carbon. They have two asymmetric carbons and four steroisomers. A Pentose is a type of monosaccharide which has a backbone of five carbon atoms. At carbon position 1, there is an aldehyde functional group attached which gives it their aldose nature. A hexose is a monosaccharide with six carbons, but more specifically, an aldohexose is a hexose with an aldehyde functional group at carbon number one. Some common aldohexoses are Allose, Altrose, Glucose, Mannose, Gulose, Idose, Galactose, Talose. 1. Use a sentence "All altruists gladly make gum in gallon tanks" to write down in order allose, altrose, glucose, mannose, gulose, idose, galactose, talose. d. at C-2: right, left, right, left, and so on. Alodopentoses and aldohexoses can exist in three different forms: the open chain as appears in the Fisher projection, the two cyclic forms of alpha(α) sugar and beta(β) sugar. Ring formation tends to be energetically more stable than open chains. Pentoses often cyclize into a ring form structure called Furanose whereas hexoses form cyclic sugars called pyranoses. The two different forms of cyclic sugars, alpha and beta, are referred to as anomers. For example, in D-glucose, the hydroxy group on carbon 5 attacks the carbonyl carbon forming a six membered ring with the carbon that was attached, being known as the anomeric carbon. The resulting hemiacetal sugar is known as a pyranose. α-D-glucose is formed if the newly formed hydroxyl group is pointed in an opposite direction to the CH2OH group in Haworth projection, and β-D-glucose is formed if the hydroxyl group is pointed in the same direction as the CH2OH group. The majority, about 66% of D-glucose exist in β form because when the molecule is in chair conformation, all the bulky hydroxyl groups will be placed in equatorial position - which have lesser steric hindrance between the bulky groups. Thus, β-D-glucose is more stable than α-D-glucose that occupied typically 33% of D-glucose molecules, whereas the remaining 1% is in the open-chain form. There are two different conformations a pyranose and furanose ring can take: chair and boat form. In the chair form there are two different orientations: equatorial and axial positions. In the axial position, the substituents will form bonds that are perpendicular to the plane of the ring. However, these bonds may often form a steric hindrance due to crowding of the substituents. If two substituents are near and pointing within the same direction, then there will be a steric hindrance. In contrast, the equatorial position will have its substituents to form bonds that are parallel to the plane of the ring. This formation produces less crowding and is the most preferred form for the chair conformation. Lastly, the boat form is unlikely, due to the fact that there is crowding and steric hindrance. 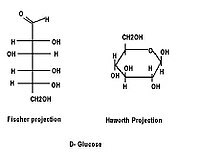 A Haworth projection is a simple way to show cyclic sugars and their glycosidic linkages. It consists of the ring on a horizontal plane but ignores the chair and boat forms so that the ring is flat. If drawn from a Fischer projection with the carbonyl on top, the groups on the right side become the groups on the bottom of the ring and the groups on the left become the groups on the top. The carbon at the very bottom of the Fischer projection is placed on top of the ring by default (if it is not a part of the ring itself). An α-linkage occurs when the hydroxyl of the hemiacetal is on the bottom of the right and a β-linkage occurs when the hydroxyl is on top. If drawing from a chair form, all groups on top of the chair become the groups on top of the Haworth projection ring. The easiest way to find all these groups is to choose an axial position that is above the ring and then go around the ring, alternating axial and equatorial positions. In the picture on the right, all the groups attached to red bonds would go on top of the ring the Haworth projection and all the groups attached to the blue bonds would go below. A ketose is a sugar that has a ketone group in each of its molecule. Dihydroxyacetone, for example, has 3 carbon atoms in its backbone - it is the simplest ketose among this category. It is also the only optically inactive ketose. In comparison to other aldoses, ketones will have one less chiral carbon than aldoses even though they share the same number of carbon atoms. Thus, when forming a ring, the ketone at the second carbon will be utilized to form a ring. Similar to aldoses, furanose rings can take up a different conformation than a ring. The other conformation is called the envelope form: C3-endo and C2-endo. Both forms resembles an envelope. Tetrose: Erythrulose A Tetrose is a monosaccharide that contains 4 carbon atoms. A Keto-tetrose is a tetrose that has a ketone functional group attached to Carbon 2 of the straight chain. A ketotetrose has 2 stereoisomers because it has one chiral center. An example of a ketotetrose is Erythrulose. Erythrulose has the chemical formula of C4H8O4. It is often used in self-tanning products. Pentoses: Ribulose, Xylulose A Pentose is a general term to define a monosaccharide containing five carbons. When there is the prefix "keto" in front of the pentose, it means that in five carbon containing sugar, there is a ketone functional group attached to the structure. A ketopentose has a total of four stereoisomers. An example of a ketopentose is Ribulose. The structure of Ribulose has a ketone functional group attached to C-2 of the straight chain figure. The diastereomer of D-Ribulose is D-Xylulose. Hexoses: A Hexoses contains 6 carbons. A hexoses containing a ketone functional group is called ketohexose. Ketohexose has 3 chiral centers and 8 different stereoisomers. Examples of ketohexose are Fructose, Psicose, Sorbose, Tagatose. Fructose can react with hydroxyl group to form a hemiketal group, and it can formed pyranose or furanose depending on whether the C-2 keto group reacts with the C-6 or C-5 hydroxyl group. D-Fructose is the most common ketohexose. The Transketolase reaction is very similar to the Transaldolase reaction. However, the Transketolase is different because it transfers a two carbon unit instead of Transaldolase's three carbon unit. Thiamine pyrophospate (TPP) ionizes so that it has a carbanion which is a negatively charged carbon. The importance of carbanion is that they can attack carbonyls, so that carbons are added in a sense to the nucleophile. TPP attacks a ketose substrate where it than releases the aldose product to yield an activated glycoaldehyde unit. An activated glycoaldehyde unit is an electron sink because of a positively charged nitrogen atom where a carbonyl of an aldose product is attacked and then separated after some electron movement. The importance of the transketolase reaction is that it is the mechanism that the enzyme TPP uses to change a ketose substrate to a ketose product that has a different group attached to it. The transaldolase reaction involves the transfer or a three carbon dihydroxyacetone unit from a ketose donor to an aldose acceptor. Unlike the transketolase reaction, transaldolase does not contain a prosthetic group; instead the reactions begins with a Schiff base formed between the carbonyl group of the ketose substrate and the amino group of a lysine residue at the active site of the enzyme. Next the Schiff base is protonated and the bond between C-3 and C-4 break which releases the aldose product. The leftover negative charge on the Schiff-base carbanion is stabilized by resonance while the positive charge on the nitrogen atom of the protonated Schiff base acts as the electron sink. The Schiff-base remains stable until a suitable aldose becomes bound which allows the dihydroxyacetone to react with the carbonyl group of the aldose and the ketose product is released from the lysine side chain via hydrolysis of the Schiff-base. Transaldolase is a target of autoimmunity in patients with multiple sclerosis which is the selective destruction of oligodendrocytes that selectively expresses transaldolase in the brain. The Calvin cycle, or dark reactions, is one of the light-independent reactions. In the third phase of the this reaction, a five-carbon sugar is constructed from six-carbon and three-carbon sugars. A transketolase and an aldolase are the major factors in the rearrangement. The transketolase, which is in the pentose phosphate pathway, requires a coenzyme, thiamine pyrophosphate (TPP), to transfer a two-carbon unit from a ketose to an aldose. Whereas the transaldolase transfers a three-carbon unit from a ketose to an aldose. In summary, transketolase first converts a six-carbon sugar and a three-carbon sugar into a four-carbon sugar and a five-carbon sugar. Then, aldolase combines the four-carbon product and a three-carbon sugar to form the seven-carbon sugar. This seven-carbon sugar then finally reacts with another three-carbon sugar to form two additional five-carbon sugars. Glucose (C6H12O6) is one of the main products of the photosynthetic process by plants that initiates the cellular respiration process that produces ATP (adenosine triphosphate), the basic energy currency for prokaryotes and eukaryotes. Glucose is also involved in the energy-harvesting process of glycolysis, which converts glucose into pyruvate and yields a much lesser amount of ATP than is produced by the electron transport chain within cellular respiration. Glucose is an essential source of energy for the body. One example of modified monosaccharides are the phosphorylated sugars. An important phosphorylated sugar is glucose 6-phosphate, which is a glucose phosphorylated on carbon 6. The significance of this molecule is that it provides energy in certain metabolic pathways, and it can be converted and stored as glycogen when blood glucose levels are high. If blood glucose levels are low, glucose 6-phosphate can be converted back into glucose to enter the bloodstream once again. A unique property of glucose 6-phosphate is that once glucose is phosphorylated, the sugar possesses a negative charge. This prevents the molecule from leaving the lipid-bilayer membranes. This allows the cell to easily access the modified sugar to provide energy for metabolic pathways such as glycolysis, or convert it to glycogen as storage. The biological significance of carbohydrates is unquestionable in the natural world with its essential roles in providing metabolic energy. Carbohydrates not only serve roles in energy, but also storage and plant cell wall structure; however carbohydrates are also involved in a variety of biological processes including the immune response, cell–cell interactions, fertilization, viral infection, and drug efficacy, among others. In recent years, researchers are discovering and understanding new sugar moieties that may have important ramifications for the development of new therapeutics. For example, the dideoxysugar and trideoxysugar moieties that are synthesized by a wide range of bacteria, fungi, and plants are representation of a captivating class of carbohydrates. They are found on the lipopolysaccharides, on the S-layers of some Gram-positive and Gram-negative bacteria, on extracellular polysaccharides, and on antibiotic, antifungal, anthelminitic, and antitumor agents. These diverse complex carbohydrates are derived from simple monosaccharides such as glucose-6-phosphate or fructose-6-phosphate that goes through numerous of enzymatic reactions including acetylations, aminations, dehydrations, epimerizations, reductions, and methylations. The bacterial N-acetyltransferases and the PLP-dependent aminotransferases are enzymes for the biosynthesis of unusual dideoxysugars and trideoxysugars. With the understanding of the structures and the functions of these enzymes that are required for the biosynthesis of the sugars, this makes it possible to redesign new drugs that will only benefit humans because these sugar moieties are only synthesized in bacteria, fungi and plants. ↑ Organic Chemistry Structure and Function, Sixth Edition. Berg, Jeremy M. John L. Tymoczko. Lubert Stryer. Biochemistry Sixth Edition. New York: W.H. Freeman, and Company 2007. This page was last edited on 13 December 2018, at 07:37.